The Acrobats of China featuring the New Shanghai Circus at Yakov’s Theater in Branson provides audiences the most memorable and electrifying performance that they’ll ever witness. This great acrobatic show features a variety of spectacular acrobatic feats and death-defying stunts that’ll have you gasping and wonder in awe. The show will treat you to a visual display of majestic performance and endurance that seems impossible to present, yet these graceful and athletic artists will keep your attention focused throughout the show with unending line-up of award-winning demonstrations such as the Spinning Girls, Butterfly Lovers, and Diabolo. This acrobatic show is participated by the Jinan Troupe, a select group of talented Chinese artists and acrobats presenting the FenMo, an innovative production that was based on an ancient foundation of Chinese artistry known as the Peking Opera. This group delivers a show with modern aspects which were designed to appeal to today’s audience. With its updated perspective, they share the centuries-old culture of China, creating electrifying and captivating act, whether it’s hoop diving, drum juggling, chair stacking or human juggling, they’re sure to give audience endless fun and excitement out from their fascinating feats in this dramatic event. Chinese acrobatics was first introduced by Mr. Lizhi Zhao to Branson bringing the magnificent troupe to display a distinctly different presentation, unique costumes, and one-of-a-kind performance style. With brilliant costuming, the “Acrobats of China” features more than twenty stunning Chinese acrobats and artists who have performed around the world. Each year this group of acrobats adds new performers creating award-winning acts like the Human Strength and Beauty, Plates Spinning, Juggling, Chair Stacking, and more. The Jinan Troupe of the Acrobats of China brings an amazing group of daring acrobats to the Branson stage. The acrobatic show features colorful costumes that perfectly harmonize with their thrilling athletic acts and display them with bravery. The show also uses state-of-the-art lighting and sound effects with thrilling musical accompaniments and stunning backdrops that are sure to amaze everyone. 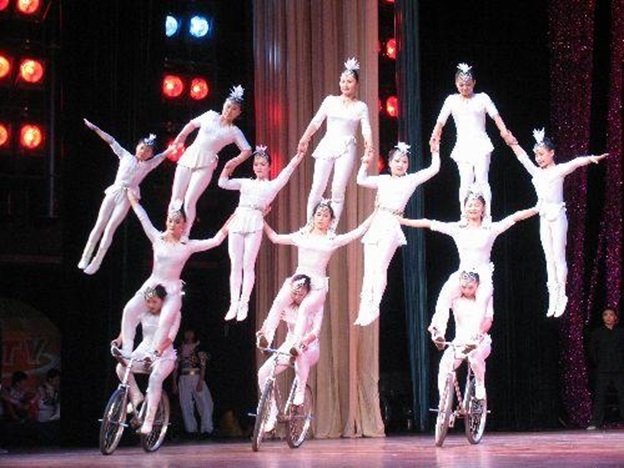 Known for their daring acts and colorful costumes, as well as their breathtaking renditions of classic Chinese dance acts and unique performance art, the troupe is considered as the most highly awarded Chinese acrobatic group. The Acrobats of China will also let you enjoy watching the Sanddorn Balance, which utilizes 14 palm branches weighing 55 pounds, and balanced on a feather weighing less than an ounce. This exquisite presentation is accompanied by magnificent costumes with a combination of modern music and Chinese opera that offers a unique treat for all audiences. The “Acrobats of China Featuring New Shanghai Circus” is one of Branson’s most popular and enduring live shows – a truly love at first sight for everyone who has the chance to watch it. So, if you want to watch an acrobatic show with a dramatic twist that abounds with high energy and captivating performances that will bring you to the edge of your seat, come see the “Acrobats of China” in Branson, Missouri.